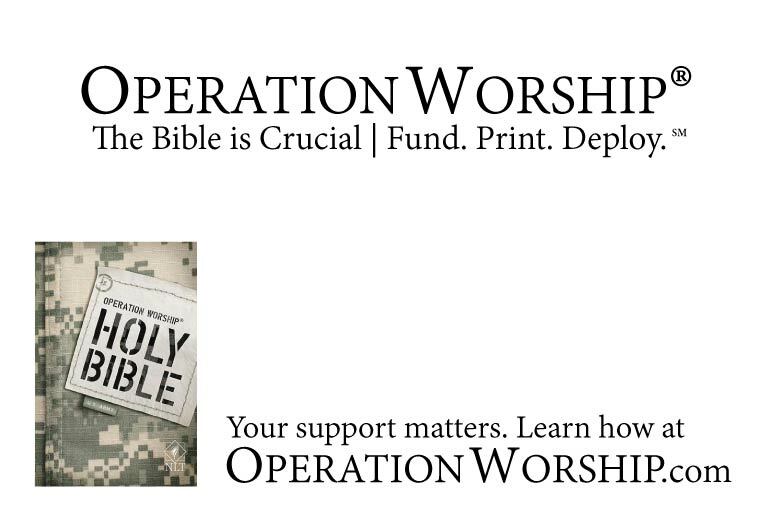 Operation Worship® provides FREE Bibles to the Military through the generous support of our community! We handle all the logistics, even shipping, we only ask for help with printing costs. Partner with us to share God’s Promises! We are receiving more requests for Bibles than we have funding to print and ship (deploy). We get funding from multiple private sources and our partners provide incredible support through discounted rates and additional personnel resources. However, we have to fill the gaps and rely completely on God’s great provision for this. He ALWAYS makes a way. Partner with us… because Jesus! Partner with us in giving hope! Waterproof and High Heat Bibles! 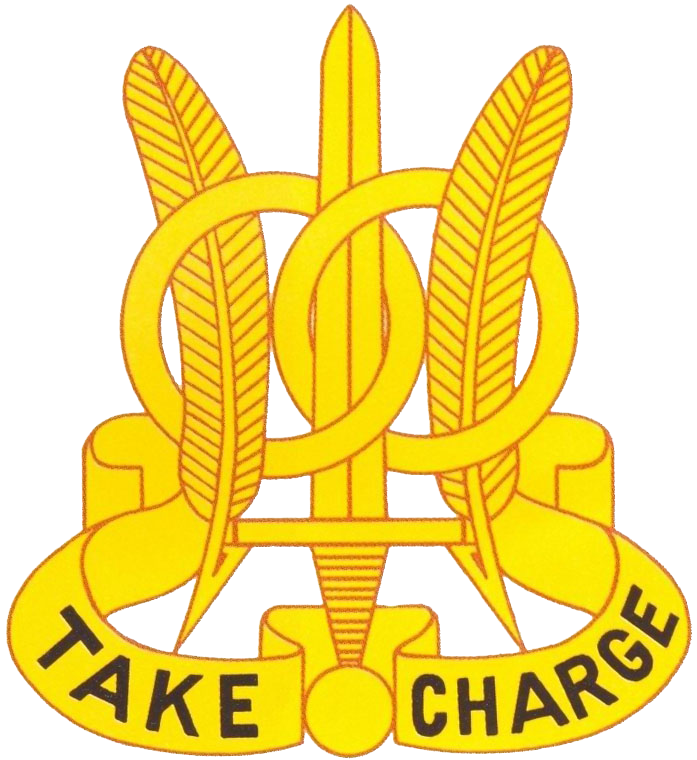 On order, the 97th Military Police Battalion deploys worldwide to conduct Military Police operations in support of Forces Command. The battalion also conducts continuous Law and Order operations in support of the Fort Riley military community. Donate a Case Pack of 32 Air Force Bibles! Donate a Case Pack of 32 Marine Bibles! 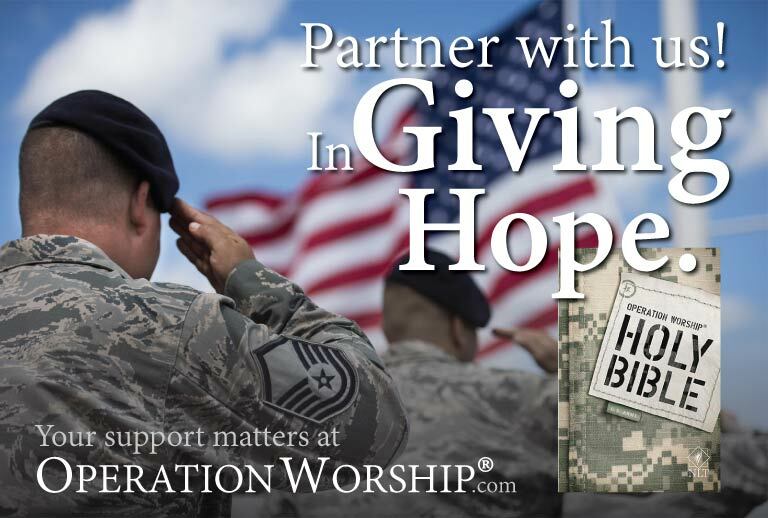 Donate a Case Pack of 32 Army Bibles! Donate a Case Pack of 32 Homefront (Pink) Bibles! Donate a Case Pack of 32 Navy Bibles! Will you share with us how Operation Worship has impacted your life? 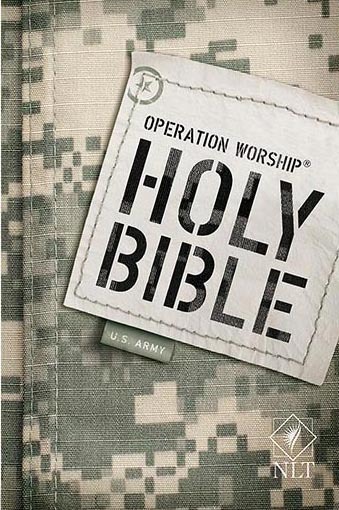 We love hearing from soldiers, chaplains, volunteers, and others who have purchased Operation Worship Bibles. Now you can inspire others through your testimony and help us to get the word out. Thank you for your contributions. We are so thankful for you! You can make a difference in so many lives, instantly. Operation Worship’s mission is carried out with great passion, purpose, and blesses many with a single act of kindness via two major conduits. 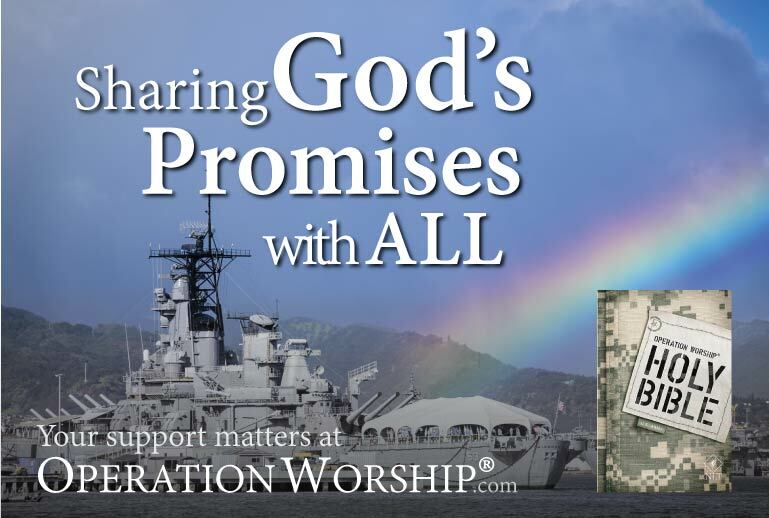 Whether it be through the Operation Worship Bible Program or by bringing Christian Music to the Military, you can be certain that your donations will be maximized to the greatest extent possible. All donations are tax-deductible and no salaries are taken. 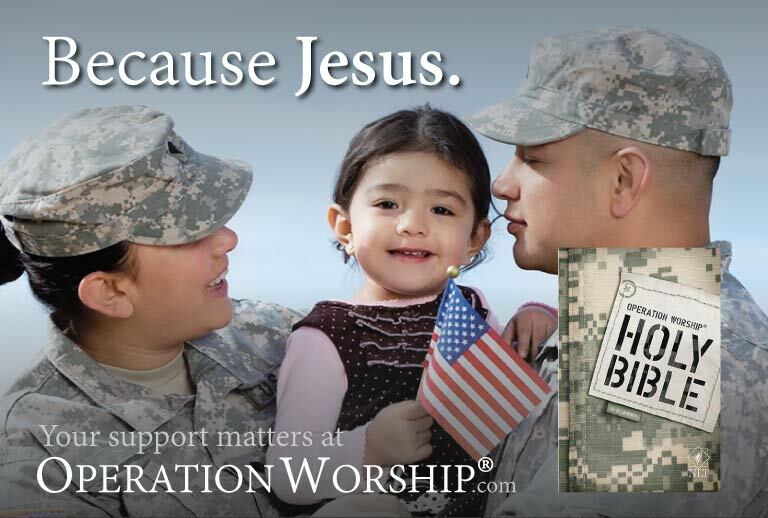 100% of your donation goes back into furthering God’s kingdom and spreading God’s Love to our US Military. 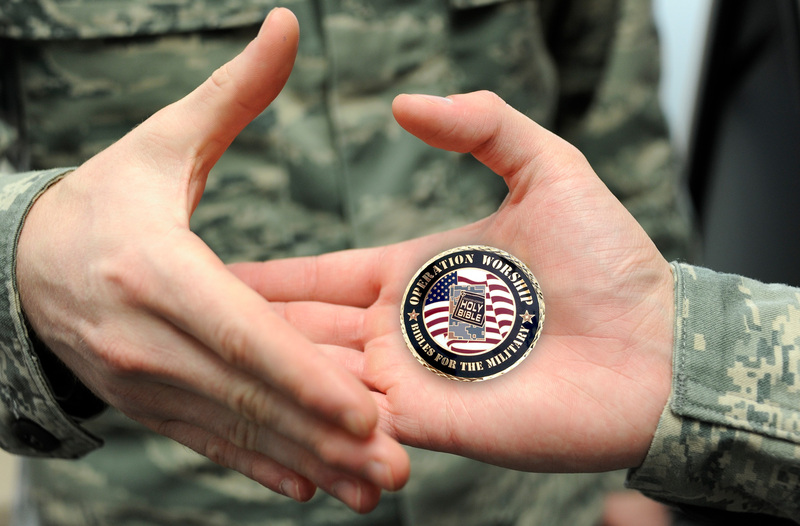 Help us say “Thank You”, “We Love You”, and “God is with you” to a soldier. Together, we can accomplish more. Click the button below to donate today!